You don't have to be a Formula 1 demigod to extract every ounce of potential from the shock-and-awe Nissan GT-R--but it wouldn't hurt. The GT-R commands respect from a cadre of cars straight out of the exotic section--cars like the 911 Turbo, Corvette Stingray, practically the entire AMG and M lineups. Key it to life, and your attention needs to be laser-focused, even though it's one of the most predictable supercars ever. You'll roll up into triple-digits speeds--in corners--before you can catch your breath. You also have to pay special attention, because the $100,000 GT-R doesn't look so wild or iconic as the other supercars that categorically fall short of its benchmarks, except in the most sensual, subjective ways. As an objective reality, nothing even comes close to the GT-R's 545 hp, 0-60 mph times of less than 3.0 seconds, or its brilliant all-wheel-drive handling. Still, Corvettes and Vipers and 911s and Veyrons have instantly identifiable shapes. The GT-R doesn't lack for a possessing style, but it doesn't quite live up to those iconic outlines, either. Its jagged outline reads more tuner car, more body kit, than instant classic. The components cut interesting swaths across its luxury-coupe outline: a tomahawk cut at the roofline chops into the rear end, and carbon fiber trim gives the plain interior just a dab of intrigue--given more panache with the red-and-black Recaros in Black Series models. You'd have to spend a lot more than the Nissan GT-R's $100,000 base price to sling yourself to 60 mph any faster on four wheels. The next step up? The Bugatti Veyron, at a cool million-point-plus, if you even qualify for consideration. Last year's rework of the drivetrain brought another 15 horsepower and 15 pound-feet to the party. The 3.6-liter, twin-turbo V-6 now thunders with 545 hp and 463 lb-ft of torque, for blistering acceleration that hooks up perfectly with awe-inspiring traction from the GT-R's brainy all-wheel drive system. Those huge wheels and tires hang on with near-bottomless buckets of grip, leaving you little room to explore the GT-R's beautifully balanced handling--which can be dialed into a softer state at the touch of a switch. With four seats, the Nissan GT-R makes two rare concessions to practicality. It's almost impossible to name another supercar with a pair of rear seats, other than the Porsche 911 Turbo--and the GT-R's actually have real leg room. The GT-R has great room for people in front, and that bit of room for small people in back, as well as a useful trunk. But don't expect too much in the way of touring-car comfort; there's plenty of noise from the road and the driveline. In fact, if you choose the new Track Edition, you don't even get the rear seats. The Nissan GT-R has the safety equipment we expect to find in any modern luxury car, and some necessary features we routinely see now in sportscars and supercars. But there aren't any crash-test scores yet, and we don't expect to get any from the IIHS or the NHTSA any time soon. A rearview camera, now standard, addresses the GT-R's blind spots. It's no longer the screaming bargain it was in 2008 when it cost less than $70,000, but at $99,590, the standard GT-R Premium still is well-outfitted with all the gadgets its drivers will want--though the $109,300 Black Edition and the $115,710 Track Edition boast their own worthwhile features. Features are as respectable as they can be without begging any mention of plush or luxurious (that it is not), but all the basics are included, as well as a great 3D nav system, Bose audio, and Bluetooth. Take the Premium Interior package--it goes a long way to correcting the inexpensive-looking cockpit, the GT-R's most visible flaw--and you'll have Infiniti-grade luxury in a car with NASA-grade acceleration. Corvettes and Vipers and 911s and Veyrons have instantly identifiable shapes. The Nissan GT-R doesn't lack for a possessing style, but it doesn't quite live up to those iconic outlines, either. The GT-R can seem a car built in halves--part extreme tuner car, part exotic. In profile it's a more ordinary coupe, clad with some boisterous fender flares, deeply scooped air intakes, and a comically large rear wing. From the front, it's more luxury car wrapped in anime armor. Neither as instantly familiar as the Porsche, or as lurid as any Italian, the GT-R has its finer points: the roofline chops into the rear end like a tomahawk, and the circular taillamps are an easy marker, now even more so that the 'Vette isn't using them anymore. It's attention-getting, no doubt, but it's more a digital-age shout-out than a quintessential, timeless take. You won't find much in common with other current Nissan models inside the GT-R, where there's a definite cockpit feel, including center-stack controls angled toward the driver and heavily bolstered seats. It looks cobbled-together and well below what the current Corvette musters, and well below the fully loaded, leather-lined 911--but when it's fitted with the new Premium Interior package, it's much more in keeping with Infiniti levels of luxury. The Black Edition earns kudos, too: it also adds a special black and red interior, with Recaro seats, plus light-weight black wheels. You'd have to spend a lot more than the Nissan GT-R's $100,000 base price to sling yourself to 60 mph any faster on four wheels. The next step up? The Bugatti Veyron, at a cool million-point-plus, if you even qualify for consideration. There's no doubt the GT-R qualifies as one of the more insane performance bargains of modern humanity. So how does it get there? By letting a pair of turbochargers rampage all over a 3.8-liter V-6. Rising in cadence with its advancing years, the formerly 480-horsepower GT-R is up to a solid 545 hp now, with 463 pound-feet of torque, tweaked last year with quicker fuel injectors for better midrange response and a new oil-pan design so it won't starve while hanging semi-permanently at the zenith of its grip. All-wheel drive and a six-speed, dual-clutch automatic transmission are the only way to restrain that kind of power and transmit it with any effectiveness to the pavement. The transmission and related bits live in the rear end to give it even better weight balance than its rear-biased setup, and Nissan worked on shifter feel and refinement last year to quiet it down--early GT-Rs generated as much driveline clatter as they did tire detritus. Constant improvement hasn't held it back at all--it's vaulted it forward even more nauseatingly quickly. The GT-R will accelerate to 60 mph in less than 3.0 seconds, and top speed has drifted up into the 200-mph zone. It doesn't waste any time in getting there either. With Launch Control, the GT-R can rip off consistent accel runs with a simple tap and flip of the traction control and sport-mode buttons, and by braking and by goosing the throttle. It's truly a once-in-a-lifetime thrill to execute one of those runs--like parachuting horizontally. It's so fast it can be unsafe to exercise fully on public roads--you'll want to save it for the track, where it's set records at some of the world's most challenging circuits. 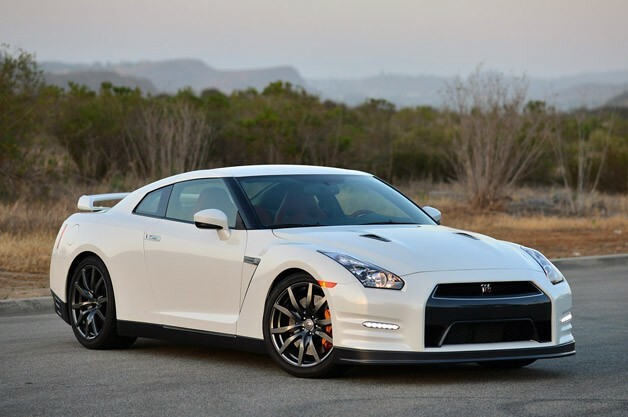 For the ultimate rendition of its Formula formula, the GT-R Track Edition is the way to spend more than $115,000. Its handling is tweaked to improve high-speed handling, with relocated front suspension bushings and a new stabilizer bar, plus new adjustable dampers and higher spring rates. With all its NASA-grade hardware, the GT-R still can leave some drivers cold. We're at a loss to explain why, but its all-wheel drive and massive, meaty Dunlop SP Sport Maxx GT treads can shave off some of the unpredictability that gives life to other supercars. They're undeniably the GT-R's defining traits, but they do make it more difficult to suss out its character. With four seats, the Nissan GT-R makes two rare concessions to practicality. It's almost impossible to name another supercar with a pair of rear seats, other than the Porsche 911 Turbo--and the GT-R's actually have real leg room. It's no grand tourer, but the Nissan GT-R works better than almost every other supercar in terms of comfort and space. It starts in front, where the bucket seats are wide and comfortable--specially selected for the American market, as it turns out. They're supportive, too, right there in Corvette territory. They're also power-adjustable and wear perforated leather, and they're accessible. Getting in and out of the GT-R is much easier than in some other 200-mph supercars. It's better than most passengers will think when they look at the back seats. They're just more usable than in any other car that's anywhere near as fast. Two kids will fit fine in back, but the sloping roof is what limits adult space in back even more than the lack of leg room. You'd have to move into cars like the Maserati GranTurismo to find better four-seat space, unless you're shopping a Track Edition--which has no back seats. There's no special packing required, either. The GT-R also has a trunk that will swallow a suit bag and a roll-aboard, and Nissan hasn't opted to deny you cupholders. The rest of the interior is stark and functional, and nothing especially luxurious or hand-crafted--unless you opt for the new Premium Interior package, which layers the cabin in lovely, less heavily treated leather. It transforms the cockpit to Infiniti-like standards. Without it, the GT-R lacks the detailing that really sets apart its competition--machine-turned metal trim pieces, even wood to relieve the cockpit's drabness. If you consider its race-ready credentials, the interior's actually a pretty plush place. All it takes is a twist of the key to remind yourself that the GT-R is a peaky, fiercely tuned supercar. There's not much effort here to quell harshness from the road and driveline, and you'll need a lot of volume from that decent Bose audio system. The Nissan GT-R has the safety equipment we expect to find in any modern luxury car, and some necessary features we routinely see now in sportscars and supercars. Along with the mandatory airbags and stability control, the GT-R also has all-wheel drive and stability control with several modes that allow conservative street driving and hair-raising track runs. The traction aids can be disabled, but you'd be foolish to do that on the street--its massive power can overpower even its neutral, balanced handling. In technology, the GT-R brings a standard rearview camera. It's almost a necessity, since the GT-R's thick rear pillars can get in the way of outward visibility. Bluetooth is also included. Despite all this, the GT-R's absolute safety ratings are a little cloudy. As is the case with nearly every other low-production supercar, there are no actual crash-test ratings available. Neither the National Highway Traffic Safety Administration (NHTSA) nor the Insurance Institute for Highway Safety (IIHS) have intentionally damaged a GT-R, and we don't expect that to change, given its extreme rarity. 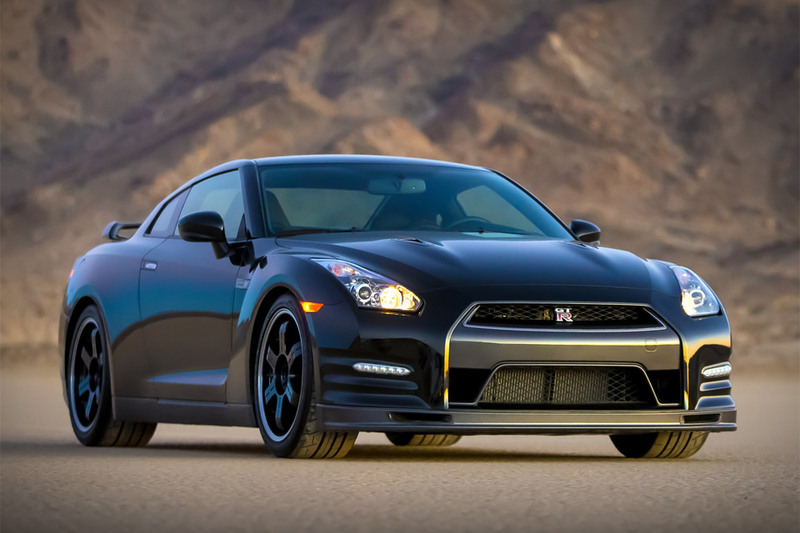 The 2014 Nissan GT-R is offered in three distinct models: Premium, Black Edition, and Track Edition. It's no longer the screaming bargain it was in 2008 when it cost less than $70,000, but at $99,590, the standard GT-R Premium still is well-outfitted with all the gadgets its drivers will want--though the $109,300 Black Edition and the $115,710 Track Edition boast their own worthwhile features. All cars require a $1,000 destination charge. Standard equipment on all versions includes a leather interior; power windows, locks and mirrors; a navigation system with real-time traffic and 3D mapping; Bose audio with Bluetooth streaming audio; and heated front seats. We can't say enough about the optional, new, Premium Interior package; it slathers semi-aniline leather on the seats, instrument panel, shifter, steering wheel, doors, and armrests, and lifts the GT-R's cockpit out of the plasticky doldrums it otherwise inhabits. It's what the GT-R would wear if it also wore an Infiniti badge. It's also the only option offered, other than a Cold Weather Package, which wraps a special coolant mix with Dunlop all-season tires. As for the other two models, the Black Edition wears 20-inch RAYS wheels with a black finish, and black paint; a carbon-fiber spoiler; and red-and-black Recaro seats and dark interior trim. The Track Edition dumps the GT-R's back seats altogether, replacing them with a lightweight quilted cloth mat; it gets its own suspension tuning, with higher spring rates, as well as brake cooling guides, a unique front spoiler with carbon-fiber air ducts, and a carbon-fiber rear spoiler for more downforce. Black six-spoke RAYS-forged wheels and Dunlop SP Sport Maxx GT 600 DSST CTT performance run-flats are standard. The GT-R's videogame-style performance gauges are pretty much a feature in themselves. Tap the screen, and the GT-R reveals a set of digital gauges that let drivers record how they're performing, whether it's grip, acceleration, or elapsed times. It's customizable, too, and Nissan even hired designers who worked on Sony's Gran Turismo game to help render the interface. If it sounds gimmicky, it's not--it's an apt piece of tech for a car so Corvette-fryingly capable. Supercars aren't often easy on the gas card, but the Nissan GT-R's fuel economy is nowhere near as low as it could be. No one's measuring gas mileage at its 200-mph top speed, of course. But the GT-R's fuel economy even on the EPA cycle is in the welcome range, in the same bandwidth as a Porsche 911 Turbo. According to the EPA, the GT-R earns 16 miles per gallon city, and 23 miles per gallon highway, an increase from the 15/21 mpg it posted in 2012. It's still not quite as good as a standard Porsche 911 or Chevy Corvette--they reach up to the upper 20s. But if you can keep your right foot under control, it's probably more efficient with its turbo V-6 than a comparable V-8 or V-12 model.